I’ll be travelling to New York / Boston this June and Seoul / Korea this October. If you’d like to journey with me, come say hello. 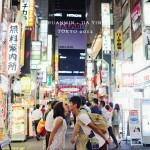 What happens when you put me in Tokyo, Japan with a great couple. Also featured on Elizabeth Anne Designs.